The Question of Design II - Genesis Alive! A library of books could not contain the complexity represented in this image...think about it. Corn, like Wheat, is one of our most important food sources, a miracle of design! Each thrive is different environments around the world for mans benefit. The Passion Flower, first identified in Peru by the Spanish as the "Christ Flower", due to its design, medicinal uses and beauty, is now grown all over the world for medicinal uses. One of thousands of beautiful plant species! Make this one by mindless accidents! Does the Grand Designer have a sense of humor to humble man? Lets consider migrating animals for a moment. For example, recent studies in salmon migration have uncovered parts of their amazing and complex mechanisms used in navigation, coming This included light angle, magnetic compass and smell systems combining into from a very complex micro-sensory system located in their tiny brain. Salmon can swim right back to their original spawning bed, even if it's a hatchery tub! I have seen Chinook Salmon swim to the very boat ramp where they were discharged, trying to nose up the steps! How did a compass get into the salmon brain and what would be its' mindless evolutionary stages? 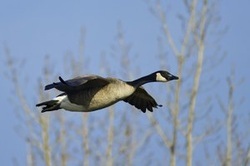 Canada Goose and migration routes, form, beauty and confidence. They mate for life. The aeronautical function of the feather is now a model for the most modern propellers and latest Fanjet engines. The hook and eye construction of feather fibers is an engineering marvel of light-weight strength. Mindlessness, self-making evolution or is this Intelligence acting on matter? Top Gun Snowbird - with attitude, summer in Alaska, winter in Africa! 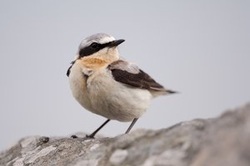 The Northern Wheatear - the ultimate "Snow Bird"
The Northern Wheatear's migration route includes summer in Alaska and winter in Africa! A high-tech guidance system mankind just doesn't understand. © 2018 Genesis Alive. All rights reserved.